SWISS scientists have concluded Palestinian leader Yasser Arafat is likely to have died from polonium poisoning, according to a text of their findings published by Al-Jazeera television. The results of tests on Arafat's remains "moderately support the proposition that the death was the consequence of poisoning with polonium-210,'' said the 108-page analysis posted on Al-Jazeera's website. It was earlier reported that scientists found 18 times the normal level of radioactive polonium in his remains. Mr Arafat, who had long symbolised the Palestinians fight for their own state, died on November 11, 2004, from an illness that was never fully diagnosed by his doctors. 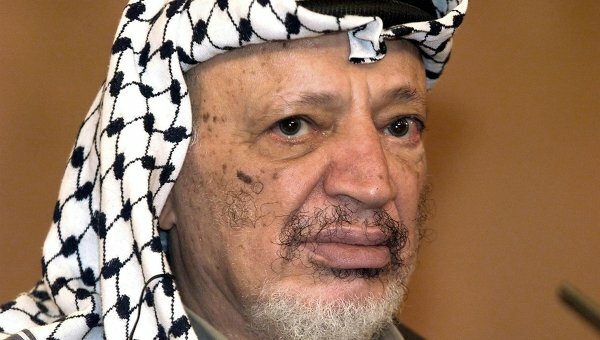 Swiss scientists have been carrying out tests on tissue taken from Mr Arafat's body and personal items with which he was brought into close contact. They say they are confident up to an 83 per cent level that the Palestinian leader was poisoned and suspect that the cause may be polonium. The results of the investigation by Swiss scientists is contained in an 108-page report by the University Centre for Legal Medicine in Lausanne which was obtained exclusively by Al Jazeera television channel which had previously carried out its own enquiry. Mr Arafat's body was exhumed last November in Ramallah on the West Bank where he was buried and 60 tissue samples were given to Swiss, French and Russian teams of forensic scientists. Dave Barclay, a British forensic scientist and former detective, told Al Jazeera that the findings had convinced him that Mr Arafat had been murdered. "Yasser Arafat died of polonium poisoning," he said. "We found the smoking gun that caused his death. The level of polonium in Yasser Arafat's rib... is about 900 millibecquerels. That is either 18 or 36 times the average, depending on the literature." The report only examined what killed Mr Arafat not whether or not he was deliberately poisoned. The death of Mr Arafat seriously weakened the Palestinian cause, of which he had been the enduring symbol for almost 40 years, and removed the one figure who could unite the diverse and quarrelsome Palestinian groups. Many Palestinians will be further convinced by the new report that Israel was behind his death. Israel had previously sought to assassinate Hamas leader Khalid Meshaal, in Jordan in 1997 by spraying what they hoped was an undetectable poison in his ear. But there will still be doubts about the trustworthiness of the evidence taken from Mr Arafat's body so long after he was buried. The radioactive substance used, polonium-210, has only a brief half-life of 138.4 days so traces detected eight years after he was supposedly poisoned would be difficult to find. There is also the question as to why French doctors, who were looking after Mr Arafat in Paris - to which he had been flown when he first fell ill - did not find signs that he had been poisoned in the days immediately after his death. France had bad relations with Israel at the time and had no reason to participate in a cover up. At the time he was taken fatally ill Mr Arafat was closely confined by the Israelis in his Ramallah compound where he had been for two years. Though he was old and not very strong he was not in ill health in October 2004 when he first fell ill with nausea and stomach pains which were at first thought to be flu symptoms. On 29 October he was taken to Jordan and then flown to France where he relapsed into a coma. Suha Arafat, Mr Arafat's widow, had given permission for his body to be exhumed after an Al Jazeera investigation into his death. After receiving a copy of the report she was quoted as saying: "When they came with the results I am mourning Yasser again. It's like you just told me he died."